I am so very excited to share this post with you and am being compensated from the National Pork Board, but as always my opinions and writing are all my own! This picture right here pretty much sums up the love this man has for what he does. More about that in a little while. A few weeks ago, I was able to go somewhere I’d never been before…. Now, before this trip, I never really gave much thought to the state of Iowa. To me, the state didn’t sound too exciting, just a bunch of farms, flat land and really not much to do except watch the corn grow – which is something that doesn’t really float my boat, if you know what I mean. After this trip, my perspective has completely changed. I’m aware of what being an Iowan means to the people who live there, have the utmost respect for farmers, their families and extended family (their employees) for the work they do to provide us each and every day with food, an awareness of the pork industry which I never really gave much thought to AND a whole new love of pork and how to prepare it! Phew! That was one heck of a run-on sentence, hunh?? I was able to attend this trip with 9 other bloggers from around the country. The night we arrived we were taken to the Pullman Bar and Diner and were served an incredible dinner prepared by Chef Sepehr Sadrzadeh. If you’re ever in Iowa City, this place is worth the stop. We were treated to a three course meal where each course included pork. DUH! We’re on the Pork tour, sponsored by the National Pork Board, you aren’t going to see or eat any of that chicken other white meat here! And pork in the dessert you say? Oh, yes, just you wait! 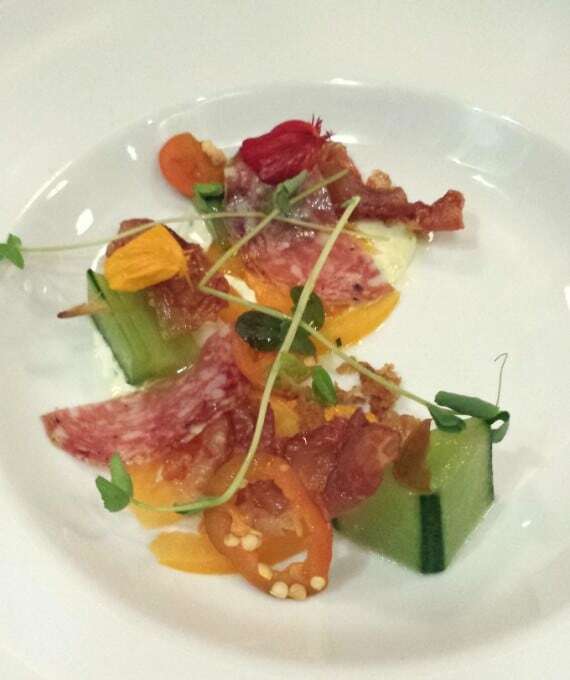 The first course was a Local Heirloom Tomato & Charcuterie Salad. It was probably THE best salad I’ve ever tasted, and the saltiness of the pork offset the tomatoes and compressed cucumber very nicely! Then the entree…oh, the entree!! A pork chop, but definitely NOT my mother’s Shake ‘N Bake pork chops. ICK! Those were dry as a bone and WAYYYYY overcooked. Sorry, mom. 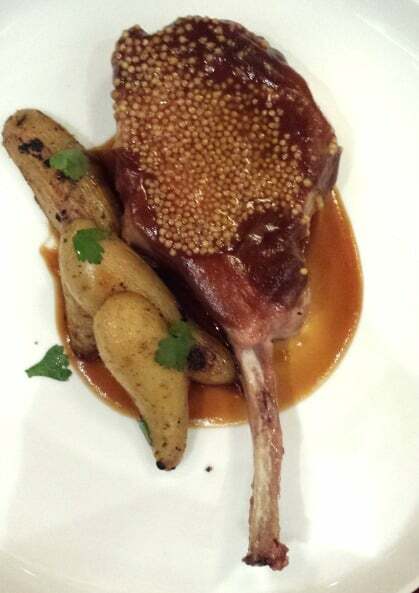 Pictured below is a 10 ounce Duroc Tomahawk Chop with a local apple BBQ sauce and pickled mustard seeds with a side of fingerling potatoes. The Duroc cut (something I never even knew existed), has more fat and more marble which gives it more flavor. It was out of this world delicious, so tender and very juicy! For dessert we were served…ready? Bread Pudding, but not just any bread pudding. 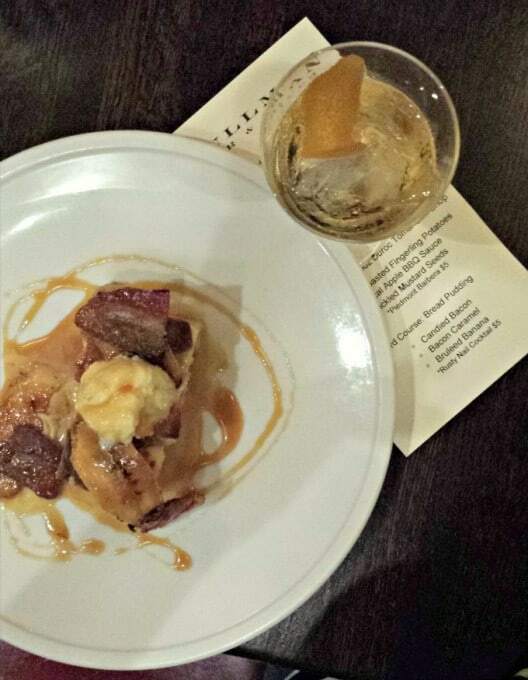 This one had bruléed banana, candied bacon AND the caramel sauce covering it… was made with some bacon fat. The dinner was a fantastic way to start off our National Pork Board Tour. During this dinner and the following two days, I learned that pork is that it’s a very versatile meat. Of course I always knew that bacon, pork chops, and pork tenderloin came from the pig, but my eyes were completely opened to how many different ways pork could be used in a meal and prepared. Another highlight of the evening was being introduced to Rob, his wife Char, their son Tim and his wife, Erin of Brenneman Pork. Rob and Char also have two daughters who work with them along with their spouses. It’s a real family farm. Here’s Rob pictured with a bowl of something that makes him very happy – bacon! 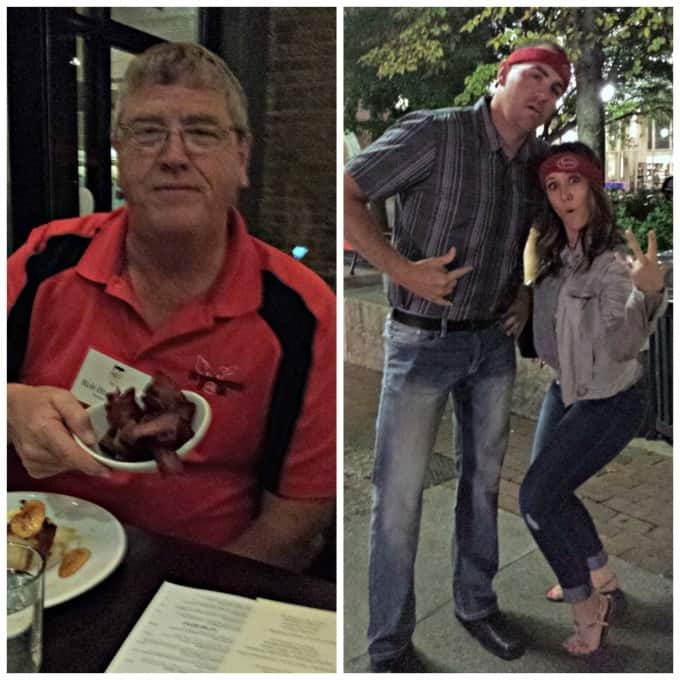 Next to him is his son Tim with Jen sporting their new Tyson headbands. This was only the beginning of a great trip! Rob started his farm in 1980 and he now owns one of the largest family-owned, top research pig farms in Iowa. He is a man completely dedicated not only to his family and the employees who work for him, but also to the pigs he farms. Every day for the past 36 years he’s been asking himself, his family and his employees, “What can we do to be better?”. Plain and simple and I couldn’t agree with him more. It was an absolute pleasure to talk with him more personally our last night over dinner. He told me that he adopted his work ethic early on in life and that along with his love for farming has clearly been passed down to his family. I can well imagine that this is the case with the 98% of family-owned farms across Iowa. Rob not only has a love for his family and farm, but for his community as well. His family employs 30 contract growers allowing people to stay in an area that they love when they might have gone elsewhere looking for jobs. With so much corporate takeover throughout the U.S. it’s wonderful to see this dedication to the people around them and their profession. The next day we awoke bight and early to begin our farm tour. A white board which taught me a thing or two before we went into the sow barn. Before we toured the sow barn, Dr. Tim Loula, the Brenneman veterinarian talked to us about the farm and gestation. He told us that the Brenneman Pork is the largest filtered farm in the U.S., which means it’s filtered from diseases. To keep the pigs disease free, every person entering “showers in and showers out” meaning we had to take a shower before going into the sow barn to ensure that we were germ-free. This allows for healthy pigs and “healthy pigs make healthy pork“. This benefits not only the pigs, but the consumer as well since the National Pork Board has lowered the cooking temperature of pork. Cooking pork to temperatures where it’s drier than bone are a thing of the past. Today, you can eat pork that is tender, juicy and very tasty! It’s a game changer, I tell ya! Dr. Tim also talked about the research at Brenneman Pork and the effort that goes in to making sure they’re breeding the best animals. 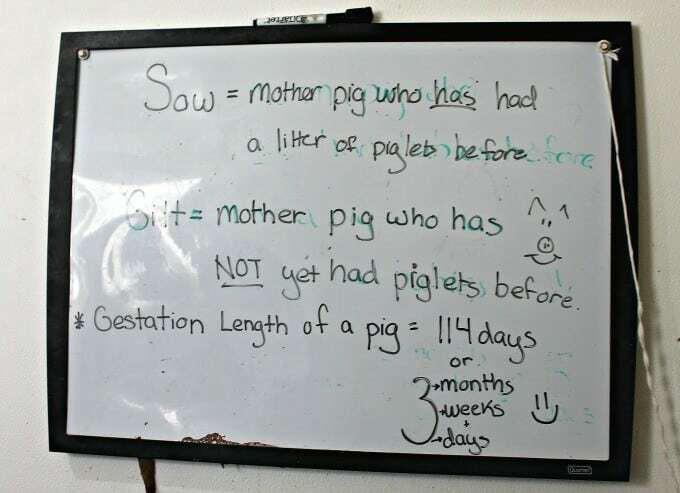 This in turn allows for a decrease in stillborns, sows that can provide sufficient nutrition for their litter while nursing, and happier pigs! Every animal is numbered and carefully tracked with their food and water intake being monitored. To hear him describe the research, care and information about the farm was mind boggling and so much more involved that I ever imagined. It also surprised me to learn that every three years, each and every employee, from the farm owner to the contract grower right down to the truck driver who transports the pigs to market, participates in the required Pork Quality Assurance Plus program. 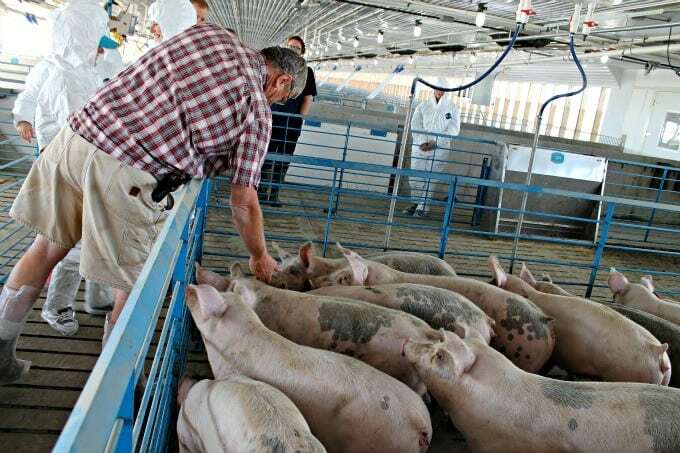 This program ensures that the pigs will be raised, handled and housed with humane practices from the moment of birth up until they go to market. 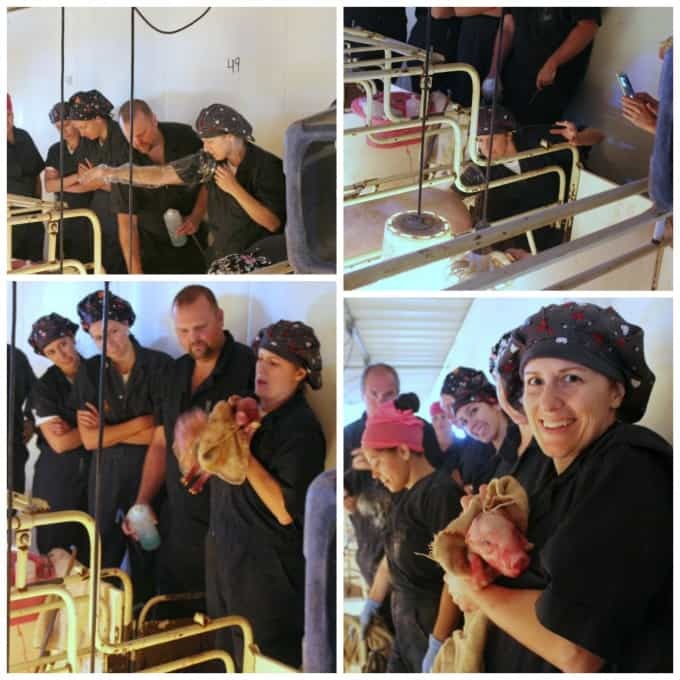 The sows and their piglets are housed in a clean, quiet and calming environment. It was amazing and so wonderful to see. The moms are kept in crates which enables her to lie down while birthing, nurse her piggies without putting her weight on top of them and keeps them in a safe, contained area. 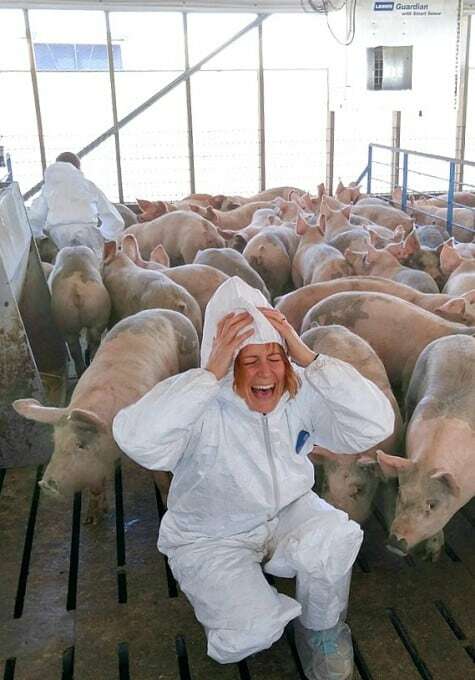 Before they become pregnant, sows are artificially inseminated when they go into heat and you can see Jen doing that in the picture on the right. Oh yes, we were able to experience all sorts of things on this farm, like something I never in my wildest dreams thought I’d be doing! Look below. As we were touring the sow barn, we found one that was farrowing, or giving birth. To help keep momma comfortable. and for the safety of the piglets, occasionally an employee (or a group of very fortunate food bloggers) will “sleeve” a pig. YOWZA!! Yes, that’s me “on fleek” in my stylish farming attire “sleeving” it up. I put on a LONG plastic glove, Chad put lube all over it and then what happened next left me speechless. I know, odd for me, hunh? But it was absolutely miraculous and something I’ll never forget. I helped that momma give birth to one of her FOURTEEN babies which is about the litter size for the majority of the sows. I so wanted to take the precious little thing home, but thought TSA might frown upon it. 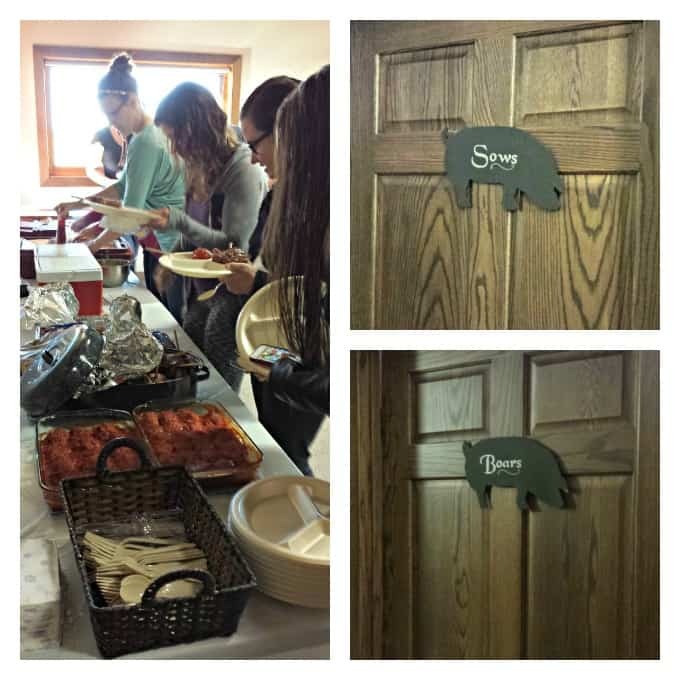 After our tour of the sow barn, Char and the rest of the Brenneman family treated us to a home-cooked lunch ’cause of course, we’re food bloggers and we have to eat! It was a wonderful spread. You can see the ham balls covered in sauce, followed by some grilled pork chops, and in those red coolers were some warm pork burgers. It was all very delicious and I was amazed at how good the pork burgers were. I’d never had them, but am very excited to make them for our family. You can also see in the picture below that the office bathrooms are most appropriately labeled Sows for women and Boars for men. It’s the little things, but it just reiterated that here at the Brenneman Farm that no little detail is omitted. After lunch we went out to the corn fields. When our family moved last year and we drove across the country, we passed many, many, many corn fields. 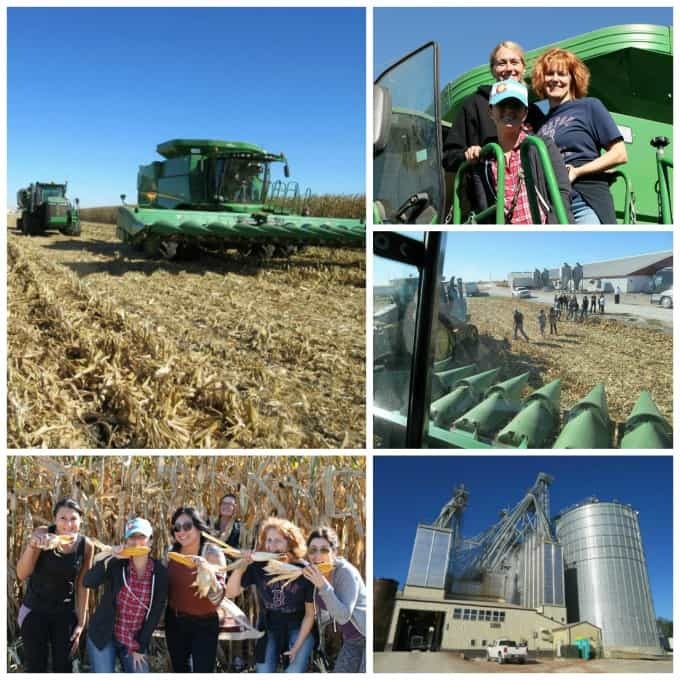 Now I know that there’s corn that is grown for animals and corn that is grown for human consumption, but it was amazing to see what goes into harvesting it and experiencing it first hand. 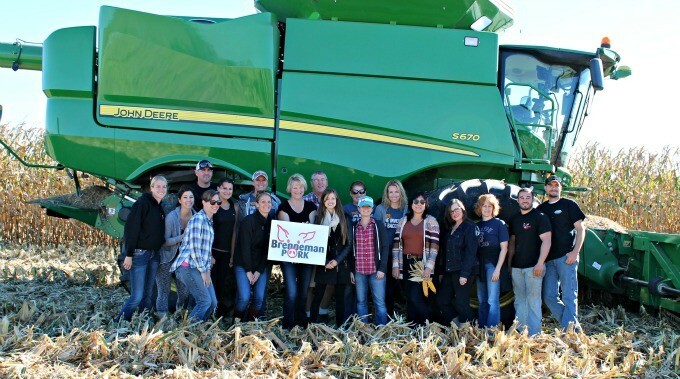 The corn grown on the Brenneman farm is done so to keep them sustainable. The corn is grown and delivered to their feed mill where it’s then used to feed their pigs. Of course, the pigs need to rid themselves of excess matter (ok, it’s urine and poop, I’m not gonna sugar-coat it) and when they do it falls between the floor slats into a large basin under the floor. The manure is then pumped and sprayed to fertilize, yes, you guessed it, the corn fields! Pretty cool how they got that cycle thing going, hunh? It’s an eco-sustainable farm! Pictured below going clockwise at left – the combine with the tractor and grain cart behind it; Sandra from A Dash of Sanity and I before Erin Brennemen drove us in the combine and for a girl raised in Chicago, she drives that monster like it’s nobody’s business! ; the view from the hot seat; the Brenneman feed mill and a group of goofy blogger girls – Ashley, Sandra, Sandra, Cathy “corn” stalking us in the back, me, and Jen. Below are Sandra, Cathy, Taylor, Lauren, Sandra, Kirsten, and Jen in our marshmallow space suits before we entered the research finisher (the barn that houses the pigs before they go to market); a pig nibbling at me; and that box up above the pigs in the picture on the right is the feeder which automatically moves through each pen to feed them. And yes, me up close and personal with the pigs. When this was taken there was a noise which I think might have been Miss Cathy doing her Sooie pig call which startled the whole lot of them, spooking me in the process! Photo thanks to Kirsten. I walked away with so very much from this trip: a love and respect for farmers, their families and employees; a new awareness of all the hard work it takes to move our food from farm to table – something I always have taken for granted; that pork is SO much more than just bacon, it’s a meat that can be used in many different recipes and no longer has to be dry! Finally, new friendships were made with everyone who participated in the trip and we enjoyed lots of laughs over the course of just three days. It truly was the experience of a lifetime. A HUGE thank you to the entire Brenneman family, their extended family as well as the other wonderful people who were such a big part of this trip. It was truly the experience of a lifetime, something I’ll never forget, always hold close to my heart and I thank you. Be sure to give a farmer a hug and thank them the next time you see one. Later, I’ll share with you what we did on the final day of our trip and talk about the recipes we made in the kitchen with the Bachelor himself, Chris Soules, so be sure to come back! Thanks so much, Ashley! It was a wonderful tip and definitely not one I’ll soon forget. I SO enjoyed our time together and look forward to more!! Thanks so much, Sandra! I’m all on board the pork train now thanks to the Brenneman’S! It was an absolutely incredible trip and one of the best parts, too was finally getting to meet you in person. Can’t wait until Tina and I make our road trip out to CA! Looks like a fun trip! I have never been to Iowa though I’ve been to a pig farm abroad. Enjoyed reading this! Thank you for coming to visit. We are so proud to share our love for our pigs. We work 24hrs a day to ensure everything is done and is done with care. Thank you for helping spread the word that farmers are your friends and can and should be trusted! It was a pleasure meeting you and all the other ladies, keep on a cookin! Great recap, Girlfriend. 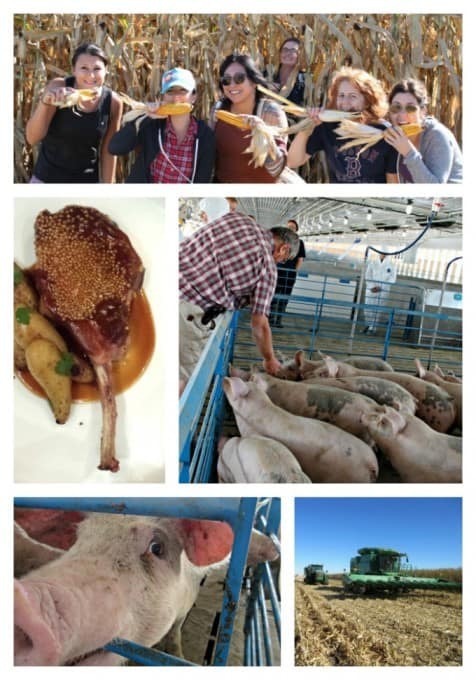 The Pork to Plate Tour was such a wealth of information, and we had so much fun that it really was hard to keep the post from getting waaaaaaay to long. Your knack for detail is sheer perfection. I look forward to the next post! Aw, Kirsten, thank you so much. The more I typed, the more I remembered! Next up, cooking with a bunch of fabulous bloggers and a bachelor! I enjoyed our time together as well. Thanks for being such a big part of it!